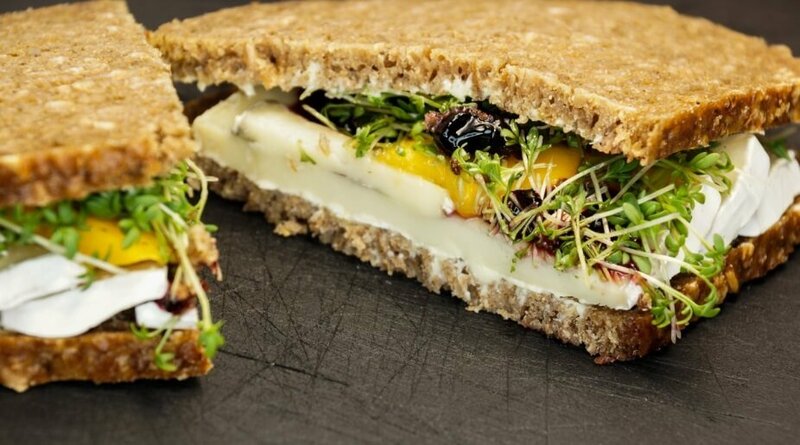 If you eat dairy, cheese is often a vegetarian go-to for daily sandwiches. But these is no reason why a simple cheddar sandwich has to be boring. As a polytunnel gardener, you could enliven a cheddar cheese sandwich with a range of different chutneys and preserves that you have created from the fruits and vegetables that you have grown. How about an apple chutney, an onion chutney, or a green tomato chutney, for example? See other articles on this site for more ideas of preserves that can be created with polytunnel produce. Not only savoury preserves but also sweet ones can also make excellent vegetarian sandwich fillings. One delightful vegetarian sandwich idea combines the soft, creaminess of cheeses such as brie with the tart sweetness of a home-made jam. You can be inventive when it comes to your jam making, or stick to the old favourites such as strawberry, raspberry or red currant jam. No matter what your tastes, you can create a vegetable paté to suit you. Simply by blending up some seasonal root vegetables from your polytunnel, such as carrots, beetroot, parsnips etc… you can create a smooth, delicious base for a vegetarian sandwich filling. Add alliums and other fruits or vegetables, herbs or spices along with salt and pepper to taste to make a vegan-friendly spread that suits you. Adding some Marmite can add depth of flavour, as well as providing B12 for those who do not eat meat or dairy. Blending mushrooms into a pate can also form the basis of a delicious vegetarian sandwich spread. Combine mushrooms with nuts such as walnuts to create a pate that is rich in protein as well as other nutrients. Combine this spread with some delicious seasonal salad straight from your polytunnel for sandwich that makes a healthy and satisfying lunch. Broad beans, or other beans from your polytunnel can also be blended to make a hummus which can be flavoured with garlic, herbs or spices and other seasoning to taste. Add tahini for a Mediterranean vibe and extra protein punch and pop this hummus into a sandwich with some tomato slices, leafy greens, and other Mediterranean vegetables. These are just a few of the many vegetarian sandwich filling ideas which polytunnel gardeners could try. There are plenty of other ideas you could consider. If you would like to share your own favourite sandwich filling ideas, please feel free to do so in the comments below.